K&N tapered type air filter is pre-oiled and ready to ride. 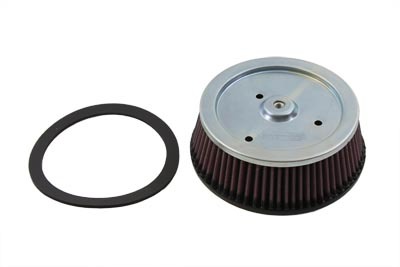 The filter is designed to provide increased airflow, which will result in increased horsepower and torque. It has a pleated design and zinc coated plates to assure years of filtration without corrosion. This replacement air filter will fit your OE air filter assembly, requires no fuel management modifications and is a washable type. The filter has three holes drilled to fit Twin Cam air cleaners with a 5-1/2" diameter metal top plate with centered 5/16"-18UNC weld nut to attach cover. It is equipped with a 6-1/4" molded rubber base.